Home staging, for the purposes of this survey was presented to Real Estate Professionals as, “Home staging: Add fresh flowers; removing personal items; reduce clutter; rearrange furniture; add new props or furniture to enhance room/s; play soft music; hang artwork in walls. See complete staging checklist.” To get a really good appreciation of what is characterized as home staging, check out the staging checklist linked above. The commentary of your participants has also left us somewhat baffled. “I don’t believe that staging adds any value except that it gets a property sold when others just sit and sit. To go in spending money and expecting it to improve the dollars in your pocket (whether you spend $100 or $10,000) is just unrealistic. I personally sold my home after upgrading to the tune of $15,000 to an already updated home, and I didn’t get more money but I got it sold.” – Uh yea-ah. That’s the point. The fact that home staging helps the home sell more quickly, thus reducing carrying costs, price reductions and perceived value by potential buyers IS value. We all know that the longer a home sits on the market, the lower the offer will be. What is the cost of the FIRST price reduction? It is usually at least 1/2 – 1% of list price. That means an average family home (approx $180K based on national NAR stats) is $9,000-$18,000. Having been one of the nation’s top home stagers since 2005, I can tell you that I’ve never seen $10,000 in staging recommendations on a $180K home. The average is usually under $2000 for that price point. Let me address another favorite one: “We’ve found that we do our own home-staging vs. hiring a professional stager. The professionals we’ve hired in the past cost a lot and the home still sat on the market for over 6 months.” I would LOVE to know if the agent who provided this quote actually picked the best stager or the cheapest. We are not all created equally. I would strongly recommend home sellers or agents considering DIY vs Professional Home Staging read Juliet Johnson’s blog about it. Watching a firestorm of comments in a private facebook chat last night after we viewed this blogs, here were some comments from uber successful home stagers about this phenom of poorly trained (and often cheap) stagers. For years Real Estate Professionals have complained about the hobbyist REP that thinks real estate is just putting a sign in the yard and a listing in the MLS. They complain that homeowners think they do nothing to earn their commission because what they see are bad agents. Hello… McFly. That’s us now. As long as Real Estate Agents decide to tell their clients that they just need to lower the sale price of the home to get a buyer, the market will erode. There are homes, all across the country, that are selling at the top of the market bands. Within every neighborhood there is a top and bottom that the market will allow for a given home of a given size. Guess who gets the top of that and who gets the bottom. It’s not random. The top of the band are homes that are well maintained and attractive. The bottom ones aren’t. They are the majority of homes on MLS. Agents who want to earn more commission and spend less marketing dollar, who want clients whose homes sell quickly, at higher sale prices turn to staging. The rest are the typical agents who don’t make any money in this business. Sure, they might sell, but their profit margins are eaten alive with listings that cost them money. It isn’t always about having the most listings, sometimes it is about having the right listings – you know, the ones that sell. ALL of the above can be included in Staging! Michelle – I could not agree with you more! Be sure you also post this on the original homegain blog that I was rebutting in my blog… we’ve got to band together to send a signal! As always, very well stated! We work with many Realtors that stage every home they list and they always sell faster and for top dollar, regardless of the market and time of year. 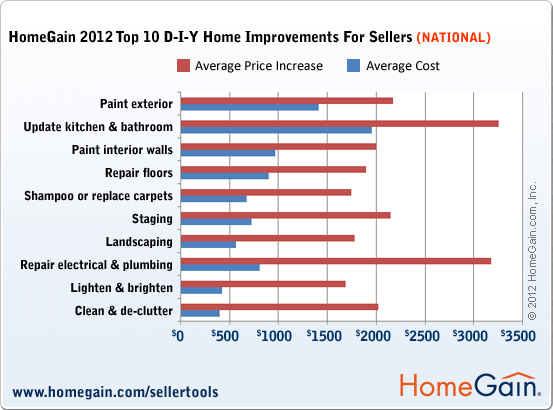 Fabulous article that speaks the truth about the home staging industry. It is sad that Home Gain does not understand nor put enough value on how much we, as professionals, do to get a home ready for sale. For the home owners who are under the delusion that upgrades alone will sell their home – they are mistaken. It is the true professionals who get homes SOLD regardless of the market and economy. Yes, and if they invest in the wrong upgrades they are no better off than they were before. That’s one of the ways we help save them money! Excellent article, Karen. We all have an uphill battle ahead of us. Glad you’re out there to lock arms with!